Welcome to the beautiful shores of the U.S. Virgin Islands! Each of our uniquely scented candles and soaps will bring you back to our soothing beaches. Our award winning Ripe Mango, Night Jasmine and Lime in de Coconut pillar candles are island favorites. Voted “Best in the U.S. Virgin Islands” four years in a row. Each richly scented pillar candle is wrapped in the lush leaves of the sea grape tree which lines our pristine island shores. 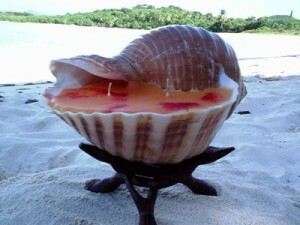 Take a look at our newest collection of shell candles. 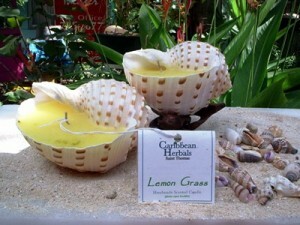 Mango scented shell candles glow brightly on its hand carved stands. Frangipani flower (Plumeria), Fragrant Orchid and Lemon grass shell also rests on its stand but are in a pale white shell. 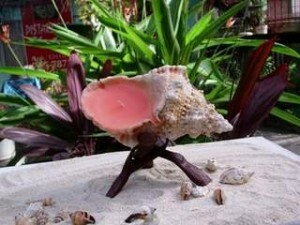 In addition, our conch shell like candles are filled with French Lavender or Hot buttered Rum scented wax and cradled on a hand carved stand.